I love expressionist fonts so very much. In 1920, Robert Wiene’s The Cabinet of Dr. Caligari stunned audiences with its dark fairy tale about a sleepwalking killer. That year also brought the release another Wiene film of eerie murder, which has fared less well. Genuine , as it is currently available, is only 43 minutes long. The fullest version resides in a museum, but has not been made generally accessible. This presents difficulty for reviewing purposes, as it’s not representative of actual finished product. Still, I can comment on what we can see of the film. The title is the name of the film’s antagonist. Genuine hails from Deep Tribal Landia, where a title card tells us she was a “priestess of a religion full of strange rites”. Her tribe loses a war, and she is put on the slave market. Creepy old Lord Melo buys her, despite warnings about her wildness. Melo places Genuine in an elaborate underground cage where he can adore her in private. What follows is a tragedy made of the broken bad plans of several people. Of principal importance to events are Melo’s grandson Percy and Florian, the nephew of Melo’s barber. There are some rather ugly and unfortunate elements to the story of Genuine. To start with, we have the all-too-common motif of white specialness in a black society. Genuine is a priestess, an elevated position within the otherwise dark-skinned tribe. This is typical of Western literature seeking to exploit a “savage” setting. The important person had to be white, because colonialism and racism and audience empathy. I must admit that this puts a twist on the standard approach, as the primal nature of Genuine is to be feared rather than celebrated. Tarzan, Liane, and uncounted others are superior to civilized people because of their guilelessness and honesty. Genuine’s wildness, however, makes her the antagonist. Florian is about to meet the girl of his nightmares. While the danger that Genuine presents sets the stage for good dramatic tension, it creates another problem for the modern viewer. As the only woman seen outside of the slave market, Genuine is not merely an individual. She is the only example of female behavior in the world of the movie, and her example is one of destructive cunning. Not exactly progressive, but what else do you expect from 1920? She’s even tamed by Percy, through no particular effort on his part. Then, of course, the mob of angry villagers comes. 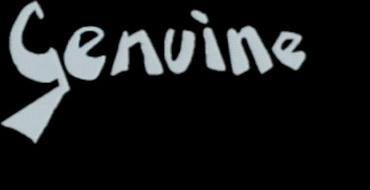 Genuine isn’t a bad movie, for its time. It’s nice to see more of Wiene’s output, especially from so close to his most enduring work. The sets are wonderful, and if you like silent film pantomime (which I do!) the acting is delightful. Sadly, it’s just not a compelling story. Also, she is not a vampire, no matter what the subtitle says.